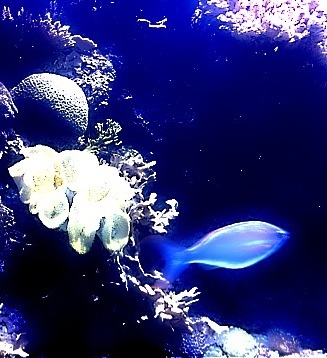 We’re in a surreal, watery world this week, but don’t be deceived. Planetary aspects are excellent for major accomplishments and getting tangible results. More importantly, this is the last week we have so much positive energy going for us, so make it count! If you can get all your ducks in a row now, it will be easier to navigate the stormy seas in the following weeks. Now is the time to finalize your trip plan, make upgrades to your boat, get all your supplies onboard, set sail, and get as far as you can. Since we’re mixing metaphors, make sure all your ducks are onboard, too. We start out the week in something of a fog, with the Moon moving through Pisces and conjoining Mars, Chiron, and Mercury. She also makes aspects to Jupiter, Pluto, and Saturn. But the ducks are lining up nonetheless, and you may find that events on Monday form a clear outline for the rest of your week. Quack, quack. Monday’s Venus-Saturn square isn’t cheerful, but it favors commitment to staying the course, no matter what. Tuesday is busy, with Mercury in a sextile with Pluto and trine with Saturn. As I’ve mentioned before, Saturn and Pluto are in mutual reception, which correlates to accelerated breakdown in whatever is useless and outdated – in our lives, in society, and in global systems. I just started reading Al Gore’s new book, The Future, in which he discusses the massive global changes about to take place. Unfortunately, I don’t think he goes far enough, perhaps due to an ossified imagination and failure to see that his worldview reflects his privileged class more than he thinks it does. But, in fairness, he gets credit for understanding that we’re on the edge of a shift that promises to be unlike anything humanity has ever experienced. As an astrologer, I translate that to the Uranus-Pluto square, with Pluto and Saturn in mutual reception for the next two years. Aspects with Saturn this week are especially powerful, as Saturn is stationed to go retrograde on February 18 (there’s got to be a “sitting duck” line somewhere in there, but I just can’t think of it). Saturn is the planet of structure, but in Scorpio it’s about breaking down structures that are decaying and weak and using the materials to rebuild forms that are stronger and more sustainable. What can you tear apart and rebuild to be stronger and more durable? Also on Tuesday, Mars conjoins Chiron. Some of our deepest wounds aren’t physical but in our energy field, where they’re often much harder to identify and treat than injuries to the body. Not only are they invisible, but some people deny they exist at all. Mars is the surgeon, and he can cut straight to the source. Just be forewarned that it may feel like the dentist sticking a pick in your teeth to find the cavity. When you jump out of your chair and howl in pain, you know you found the problem. Resist the temptation to slug the dentist. Thursday is Valentine’s Day, and while the Moon makes lovely aspects to the Sun and Venus, the Moon is in Aries, the “me-first” sign. Be prepared to lavish attention on anyone who gives you chocolate or flowers. If you don’t, they will feel unappreciated and resentful. But with Mars in Pisces, you probably won’t hear about it until Christmas, at least not directly. Friday and Saturday are the power days, with Mars sextile Pluto and trine Saturn. Action is the order of the day, and it’s a highly transformative energy. Here is where you can make the most progress in changing what isn’t working in your life. The key is that there has to be common good in your plan. Whenever Pluto is involved in an aspect, selfish goals backfire, as do any plans that include manipulating others to do your bidding. As I mentioned in last week’s forecast, one way that all this Pisces energy could manifest is a lifting of the “veil” between worlds that forms boundaries between dimensions of time and space. As a result, some of you may feel light-headed and disoriented, or you may have bizarre or disturbing dreams. Take extra care with alcohol and recreational drugs. You may find that you can’t tolerate as much as usual or that it affects you in unpredictable ways. Time to get back to my ducks. This entry was posted in Forecasts and tagged mars in pisces, Mercury retrograde, Saturn and Pluto in mutual reception, Saturn in Scorpio, Uranus-Pluto square on February 10, 2013 by Pat. May your happiness be without limit. © Pat Paquette, 2013. The most significant astrological event this week is the New Moon in Aquarius, which also happens to be the Chinese New Year. But the flavor of the week is definitely fish. Starting this week, we’re approaching a stellium of planets in Pisces that will culminate in an emotionally volatile New Moon in March. In the meantime, Mercury will turn retrograde in Pisces and conjoin Mars twice. My read on this is that we’re about to go through a collective release of accumulated anger, frustration, grief, and past-life trauma. Not that this hasn’t been happening in a big way already, but I think it’s about to get even bigger. Over the past week, I’ve been following comments on a few news stories, and I’ve been struck by how stupid, mean, and argumentative people can be. And I don’t know if it’s just my imagination or if reading comprehension is at an all-time low. Don’t they teach that in school anymore? Or could it be that Jupiter stationed in Gemini is translating to a fixation on details without understanding the overall point of the article? Regardless, I see this as the collective venting of a high level of frustration and anger. The real source of public frustration – the corporate thieves who plundered the economy, drove up the unemployment rate, and got off scot-free, along with their political accomplices – are protected behind gated communities and armed guards. And they are no doubt pleased that, instead of plotting to storm the Bastille, the “little people” are either fighting among themselves or dousing their pain through addictive and escapist behaviors. Ah, but the plotting thickens, in however small a way. It’s heartening to see people rallying in support of a waitress in St. Louis who was fired from Applebee’s last week for posting a customer’s rude note online. Many of the comments on news stories display an appalling lack of comprehension of the facts, but the response was visceral, and in this case, channeled in the right direction. Although there were some unbelievably rude and bigoted comments about the customer, the majority response was to call for a boycott of Applebee’s and its parent company, IHOP. For its part, Applebee’s showed its true colors by totally failing to grasp the extent of the public outrage. In its official “explanation,” you can almost hear the collapse of a decaying corporate structure. This is all just a long way of saying that a revolution is indeed in the works – not that we haven’t known for years that it was coming, given the Uranus-Pluto square with reinforcement from Saturn in Scorpio. I always maintained that the rebellion would be a class war. With Mars in Pisces, the collective anger is going to make itself felt – all the more so when retrograde Mercury conjoins Mars later this month. It’s critical in the next six to eight weeks that you look for ways to channel any anger and frustration into appropriate action. Now, there’s another way that all this Pisces energy could manifest, and that’s the thinning of the “veil” between worlds, sometimes called the “Veil of Isis.” More and more people are beginning to have memories, dreams, and visions of incarnations in other dimensions of time and space. This is very definitely the realm of Neptune, and confusion and disorientation are key attributes of the ninth planet. These memories can be distressing. Depending on what happened and how vividly you recall the event, the force of the emotional release could be explosive. This is especially true of karmic relationships. It’s my observation that merely knowing what happened in another lifetime usually isn’t enough to overcome a negative pattern or obsession with someone. The emotional charge has to be released, and then something changes internally that allows you to move on. Anyone who has gone through this process knows that it can be upsetting. Mars conjoins Neptune on Monday, but we’re already feeling it. On Tuesday, Mercury enters Pisces, where he’ll turn retrograde on February 23. In all, Mercury will remain in Pisces for more than two months, when he normally breezes through a sign in three weeks. I mention this now, because Mercury enters pre-retrograde shadow on Friday, making it all the more important that you take action in the next two weeks to establish your course for the rest of the year. Even though we’ll be sailing through patchy fog, all of the planets are now direct and giving us a huge green light until February 18, when Saturn turns retrograde. This is the only period in 2013 with all ten planets direct – actually, all the asteroids, too – and we won’t have one in 2014 at all. Of course, the biggest news this week is the New Moon in Aquarius on February 10, which is also the Chinese New Year and the beginning of the Year of the Water Snake (more water!). Since the rest of this week’s aspects are contained in the New Moon chart, I’ll discuss them in that context. This is a bowl chart with an odd sort of symmetry. The Sun and Moon are at the bottom at 21 degrees Aquarius, not in aspect with any other planets but in a square with the lunar nodes by exact degree. And, of course, all of the planets are direct, making this a remarkable New Moon chart filled with the promise of a head-spinning fast-forward. Mercury and Mars are conjunct (the alignment is exact on Friday), providing a glimpse of what will come later this month, after Mercury turns retrograde and the two planets are conjunct for a second time. Communication is key here, because otherwise the combined energy of this pair is passive aggressive. That’s what the Applebee’s customer did, and it came back to bite her in the behind. Her beef was with management, and the whole incident could have been avoided had she communicated directly. Mercury and Mars are both square Jupiter in Gemini at the New Moon, and Mars is still in conjunction with Neptune, so it will take some effort to communicate clearly and effectively, and failure to do so could have exaggerated consequences. Chiron is in on this alignment, too, so there is an increased risk that someone is going to end up with hurt feelings. But it doesn’t have to be this way. Jupiter and Uranus are sextile by exact degree and Mars and Mercury are approaching a trine with Saturn – all indicating positive ways to redirect anger and irritation. If you can summon up the courage to be candid and direct, you can shift the level of the discussion to higher ground and build new ties in your personal and professional relationships. Venus sextiles Uranus on Wednesday and trines Jupiter on Thursday. These combined energies suggest unexpected opportunities and a stroke of brilliant luck, most likely in the areas of career and financial deals. Thursday is a great day for signing contracts. However, at the New Moon, Venus is in a close square with Saturn, suggesting cold water thrown on plans that looked so good only a few days earlier. At the very least, you may have some version of buyer’s remorse, that “What could I possibly have been thinking?” feeling. Well that’s what Mercury retrograde is for. You’ll have a couple of weeks to do some additional research, and if you want to change your mind, you’ll probably get an opportunity to do so. The square from the Sun and Moon to the lunar nodes suggests that whatever takes place at this New Moon could have a feeling of fate or destiny about it, at least collectively. It may apply in individual cases, too, depending on where the Sun, Moon, and nodes currently are transiting your chart. 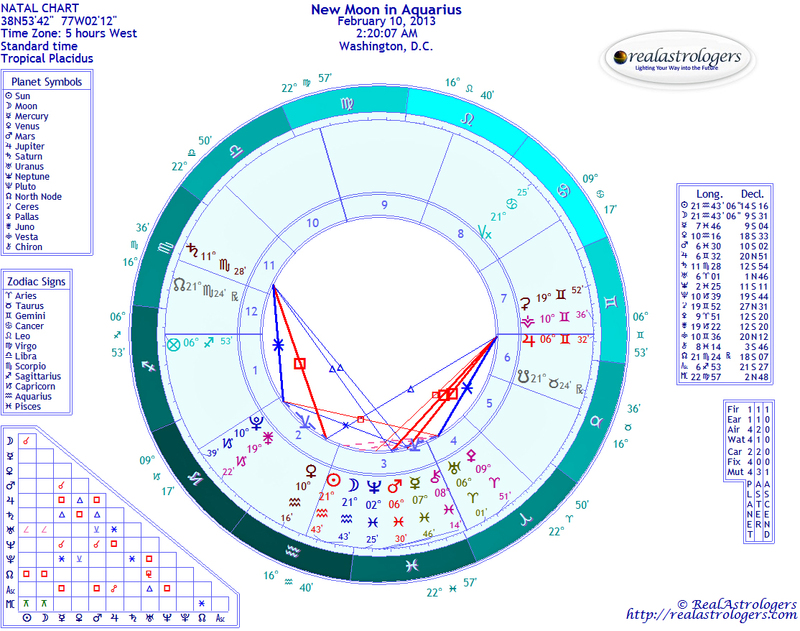 It’s also intriguing to note that the Uranus-Pluto midpoint and the Venus-Mars midpoint are both 23 degrees Aquarius, with the Sun and Moon just two degrees away. This further suggests events that are fated and part of the overall evolution/revolution of Uranus and Pluto. Gender relations are part of this scenario as the struggle continues for women’s rights and an end to violence against women and girls. Frankly, I’d like to see an end to violence against women, girls, boys, men, cats, and dogs. The collective release of accumulated anger, pain, and trauma – whether from this lifetime or other incarnations – will go a long way toward that end. Just be prepared for a really big mess. This entry was posted in Forecasts and tagged mars in pisces, Mercury retrograde, Neptune in Pisces, new moon in aquarius, Uranus-Pluto square on February 3, 2013 by Pat. Reader Osk Ingad Alden sent this photo, with the following explanation: My Pisces had his fifth birthday so we went downtown to the aquarium in Denver. It almost looks like the fish is swimming in the starry universe. Good fish! Forget “the new paradigm.” Everything is in such flux that we’re getting a new paradigm several times a month. First it was Egypt and revolution in the Middle East. Now it’s bloody suppression of revolution in the Middle East. The next shift could be civil war in Libya, and who knows where that might lead? Meanwhile, closer to home, the Republican governor of Wisconsin moved to bust the unions representing state employees, prompting a showdown in the legislature and a march on the Capitol by thousands of protestors. It worked in Egypt. But it won’t persuade Gov. Scott Walker, who says he’s going to go ahead with his plan anyway, with the backing of the newly elected Republican majority. Can you spell Khadafy Qadhdhafi Gaddafi? Things may quiet down a little this week, when Mercury and Mars join the Sun in tender Pisces. But it won’t be for long. Next month, rebellion planet Uranus enters Aries, sign of the warrior, with several planets following shortly afterward. By the New Moon in Aries on April 3, eight out of ten planets will be in cardinal signs, with six in Aries. Hopefully I’ll be caught up with my backlog of consultations by then so I can write a proper New Moon post. This week, Mercury enters the sign of the Fishes on Monday followed by Mars on Tuesday. That is “Fishes,” by the way – plural. Pisces is two fish, each swimming in a different direction but tied together with a knotted cord. If you want to know what this symbolism means, watch a Pisces in front of a supermarket shelf trying to choose among 27 different kinds of peanut butter. So let’s hope the Sun, Mercury and Mars inspire us to be the good fish and not the bad one … although you will find plenty of examples of bad fish in the headlines this week. Unfortunately, giving a sword (Mars) to a bad fish isn’t a good idea. They tend to do things like killing in the name of the Lord. The big day this week is Friday, when Jupiter in Aries squares Pluto in Capricorn. Although the planetary signature under all the unrest in the world is complex, Jupiter squaring Pluto is a major factor, especially with Jupiter in Mars-ruled Aries. This aspect repeats a pattern from the peak of the cardinal T-square last summer, and it’s mostly about who has the money versus who has the power. Then something shifts this week, when Mars enters Pisces. With Mars no longer in Aquarius, the sign of revolution, political unrest gives way to fighting on behalf of religious ideals. Moreover, Mars and Jupiter will be in mutual reception (Jupiter was the sole ruler of Pisces before Neptune was discovered in 1846). I’m somewhat concerned the focus will shift from demands for freedom and individual rights to religious extremism – if not religious, then political. However, there’s another set of aspects on Friday that could help turn conflict into a constructive dialog for growth and positive change. These occur right before and after the Jupiter-Pluto square, starting with a conjunction of the Sun and Mercury, followed by a sextile from both to Pluto. This is where it gets really interesting, because all of that pent-up energy from the Jupiter-Pluto square has a path of release. Sextiles are open channels that allow energy to flow freely. Confrontation can be constructive or destructive. This planetary alignment favors a positive outcome – at least, for those who want it. Some factions profit by stirring up conflict and so aren’t inclined to seek resolution. These fishes aren’t just bad, they’re rotten. On Sunday, the Moon in Capricorn goes through a quick review of the week’s aspects, starting with a conjunction with Pluto, then moving on to a square with Jupiter, a sextile to the Sun and Mercury, and a square to Saturn just so the taskmaster doesn’t feel left out of the T-square party. He’ll get his turn in a few weeks, though, and if you pay attention on Sunday, you may get a big hint about how it’s all going to go down. This entry was posted in Forecasts and tagged cardinal T-square, Jupiter square Pluto, mars in pisces, Pisces on February 20, 2011 by Pat.